Scopus have changed how users access their resources remotely (from off-campus). Below is a link to the steps NUIG users now need to take to gain this access. The Academic Writing Centre now offers phone consultations. This service has been specially designed for all NUIG distance learners, including students in St Angela’s College in Sligo, and students who are temporarily unable to attend on-campus sessions due to illness or disability. We look forward to talking to you about your work. BOO!…Halloween is around the corner and the staff at James Hardiman Library wish you all a safe and Happy Halloween! Students! 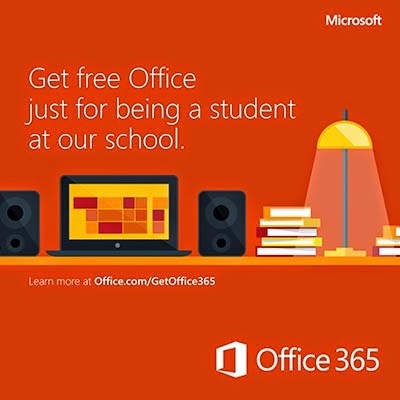 Now you can get Microsoft Office for FREE! NUI Galway has made an agreement with Microsoft to provide Office to every one of our students for free. This automatically updatable, subscription-based software ensures our students always have the latest version of Word, Excel, PowerPoint, OneNote, and more for as long as they’re a student here and the program continues. According to IDC, students with Office skills are better prepared for work in the professional world. This offer is available to all students at NUI Galway. To get your complimentary Office, visit ISS4Students and follow the on screen instructions. Our spotlight exhibition on astronomy ends this week in the Reading Room, and this is your last chance to see Joseph Jérôme Le Français de Lalande’s Astronomie (Paris : La veuve Desaint, 1792). Lalande (1732-1807) started his career in law, but a chance meeting with the astronomer Joseph-Nicolas Delisle (1688-1768) changed his focus to astronomy. A year later he was in Berlin, observing the parallax of the moon. He became a member of the Académie royale des sciences in 1753, and published on Halley’s comet and the planet Venus. He succeeded De Lisle as professor of astronomy in the Collège de France, and subsequently became director of the Paris Observatory. His is one of 72 names inscribed on the Eiffel Tower. Our copy was gifted by the author to Nevil Maskelyne (1732-1811), the fifth Astronomer Royal at Greenwich. You can also view the spotlight exhibition in its entirety on the digital display wall in the Hardiman Foyer during the month of October. If you would like to view this item, please contact the staff of the Special Collections Reading Room in the Hardiman Research Building at specialcollections@nuigalway.ie. The HSE Open Access Research Advisory Group have announced a new Open Access Research Award. The research must address a specific health problem. Areas of inquiry can draw on expertise from anywhere across the spectrum, from the medical, nursing, health and social care disciplines to management. Its ultimate aim should be to fuel significant progress and/or a fundamental change in our collective understanding of an important issue. The output must be published in a peer-reviewed journal and openly accessible. Major dissertations which are openly accessible are also eligible. The authors must agree to deposit the research in Lenus the Irish health repository. The research must have been published in the past 24 months. The 'Nomination for open access health research award' form is available at www.lenus.ie Applicants should submit their form online by 5pm 28th November 2014. The second lecture in our Special Collections Lunchtime Lectures Series is fast approaching, and this month we focus on 'the book'. On Wednesday Nov. 5th, Dr. Justin Tonra of the English Dept. will visit the bad books in our special collections. Some fine examples will be on display during the lecture. This lecture forms part of a series of seven lectures to be hosted by Special Collections at the James Hardiman Library throughout 2014-2015, each focusing on a different topic. Spotlight exhibitions will accompany each topic. This is a free event, held at 1pm in Room G011 on the ground floor of the Hardiman Building. All are welcome. The family of the late Professor Kevin Boyle, co-founder of the Irish Centre for Human Rights (ICHR), has kindly deposited the Kevin Boyle archive at the James Hardiman Library, NUI Galway. This important archive has much to say about the pursuit of human rights in Ireland, the UK and internationally. 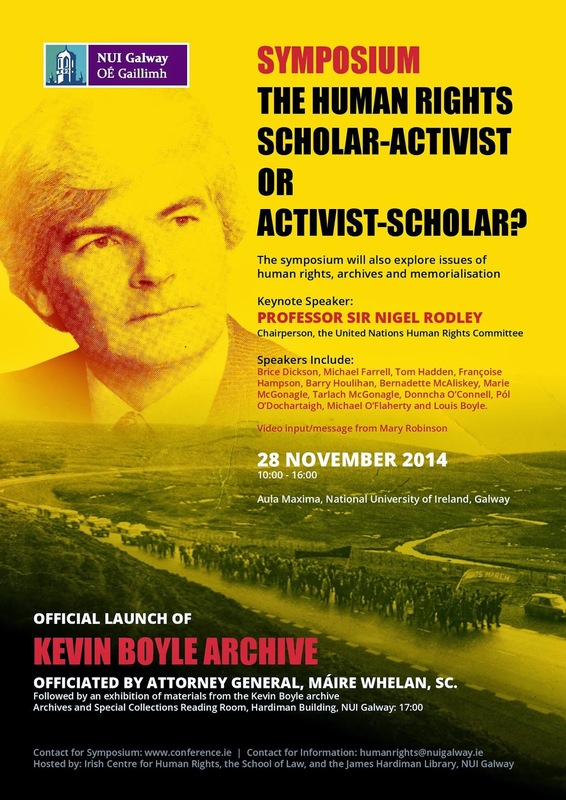 The Archive will be launched at a series of events at NUI Galway on the 28th November 2014. A day-long symposium, organised by the ICHR and the School of Law, will bring together leading human rights scholars and activists to address the theme “The Human Rights Scholar-Activist or Activist-Scholar" and will also explore issues of human rights, archives and memorialisation. The keynote speaker is Professor Sir Nigel Rodley, Chairperson of the UN Human Rights Committee. Following the Symposium, the Archive of the late Professor Boyle, catalogued and available at the Hardiman Library at NUI Galway, will be officially launched by Máire Whelan, S.C., Attorney General. There will be maintenance taking place on Emerald's research platform, Emerald Insight, on Friday 24 October 2014, between 23:00 GMT and 03:00. During this maintenance window, Emerald Insight will be unavailable for up to 1 hour. If you access the website during this time you will receive a 'connection timeout', or similar message, within your browser. Please note that this may also affect some functionality on emeraldgrouppublishing.com. Our October spotlight exhibition continues in the Reading Room, with a look David Gregory’s Astronomiæ physicæ & geometricæ elementa (Geneva : M.M. Bousquet & Co., 1726). First published in Oxford in 1702 after the author (1659-1708) took his doctorate there, it proved to be a popular treatise on ‘the writings of the illustrious Sir Isaac Newton’. Its preface includes a history of astronomy. Plate V from: Astronomiæ physicæ & geometricæ elementa. Phishing - Don't be a victim! !